From Sam Wang's PEC as of November 2, 2012 8:00 p.m. EST. 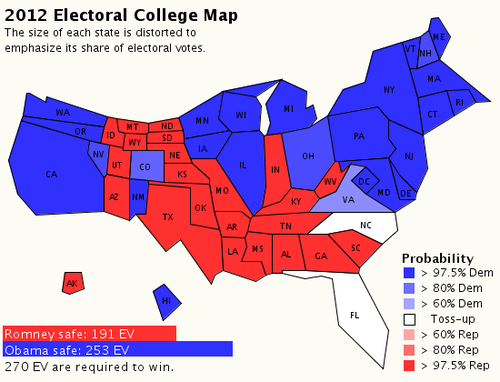 I like this map because it shows the states with their respective sizes relative to their importance in the electoral college - roughly comparable to relative population. Sam's map looks a lot like mine with NC and FL still toss-ups. Sam is generally more optimistic than I am and has an interesting graphic showing the history of the aggregate polls with highlights of the history of the race. This is his EV estimator. The target zones he explained a few days ago as similar to the target zone of the eye of a hurricane. The red zone is his 66% probability variation and the yellow is his 99% level of certainty. The gray is the 99% probability range throughout the history of the contest. 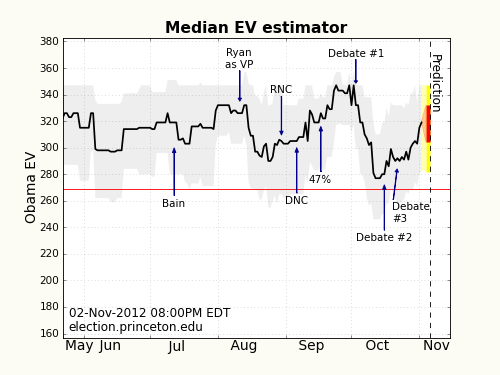 You can pretty well see what Romney's best day of the campaign was shortly after Debate #1. Sam makes a strong argument based on this graph that it was the VP debate that actually stabilized the Obama free-fall. After Debate #2, it started back up. Sorry, Romney fans. Whatever happens on Tuesday, I will follow my wife's rule with regard to the BYU-UofU rivalry - no gloating. Except I won't follow the part of the rule about cheering for whoever is behind at any point of the game. Sorry, Romney.